Few backpackers who have walked the Minong Ridge Trail will argue that this 29-mile route is one tough trek. Minong Ridge is not only the most challenging stretch of the Isle Royale’s 161-mile trail system, but arguably the hardest hike in Michigan. No other trail in Michigan uses cairns so extensively. Along many open stretches you are simply hiking from cairn to cairn and at times it’s easy to miss the next one. Few backpackers who have walked the Minong Ridge Trail will argue that this 29-mile route is one tough trek. 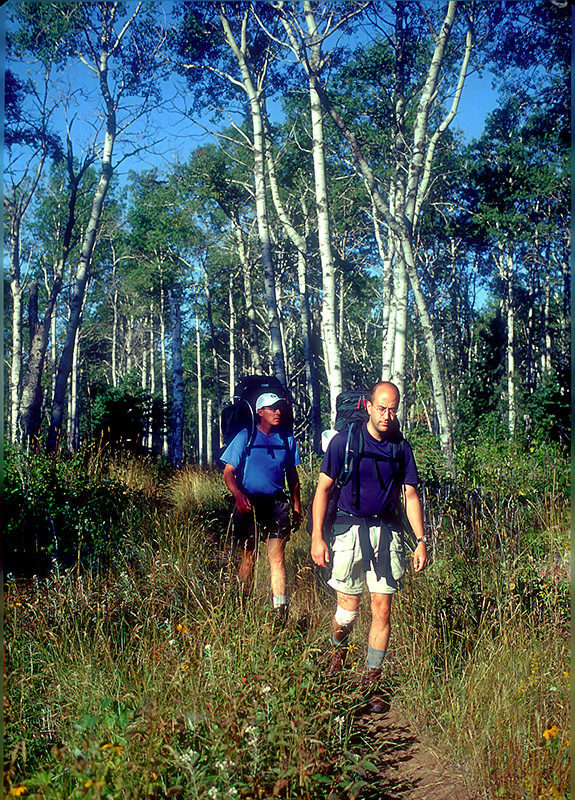 Minong Ridge is not only the most challenging stretch of the Isle Royale’s 161-mile trail system but arguably the hardest hike in Michigan. And that's the way the park staff intends to keep it. The Minong Ridge Trail was cut in the mid-1960s as a "fire manway," a route firefighters could use to access the isolated northern half of the island. Almost from the beginning, backpackers began following it, and eventually, the National Park Service decided to maintain the route as a primitive trail with as few markers, bridges, and boardwalks as possible. That’s the appeal and the challenge of Minong Ridge. Part of the challenge is the amount of time needed to hike it. The trail itself is a three to four-day walk from McCargoe Cove Campground to Windigo. But most backpackers also need another two days to reach McCargoe Cove from Rock Harbor. Carrying six days worth of food and fuel makes for a heavy backpack on a trail where you want to be as light as possible. Minong Ridge is also an up-and-down hike that, at times, will have you wondering if you’re headed in the right direction. Portions are a path in the woods but much of it is a route along a rocky ridge where the only indication of the trail is an occasional rock cairn. No other trail in Michigan uses cairns so extensively. Along with many open stretches you are simply hiking from cairn to cairn and at times it’s easy to miss the next one. If you become temporary turned around on the ridge, pause and search for a cairn or backtrack to the last one you passed and start again. This section covers the Minong from McCargoe Cove to its junction the Hatchet Lake Trail, an 8-mile trek. The Minong Ridge Trail is best hiked from east to west, leaving the long 12.6-mile portion from Lake Desor to Windigo for the end. If you’re following the trail at the peak of summer from mid-July to mid-August, start the day early and carry two quarts of water per person. It can be hot on the open ridge, and water can be hard to find at times, particularly between Little Todd Harbor and North Lake Desor. 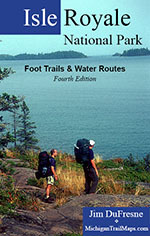 The Minong Ridge Trail is covered in detailed with maps in Isle Royale National Park: Foot Trails & Water Routes by Jim DuFresne. To order the 184-page guide to the Greenstone Ridge Trail and the rest of the wilderness island, Click Here. 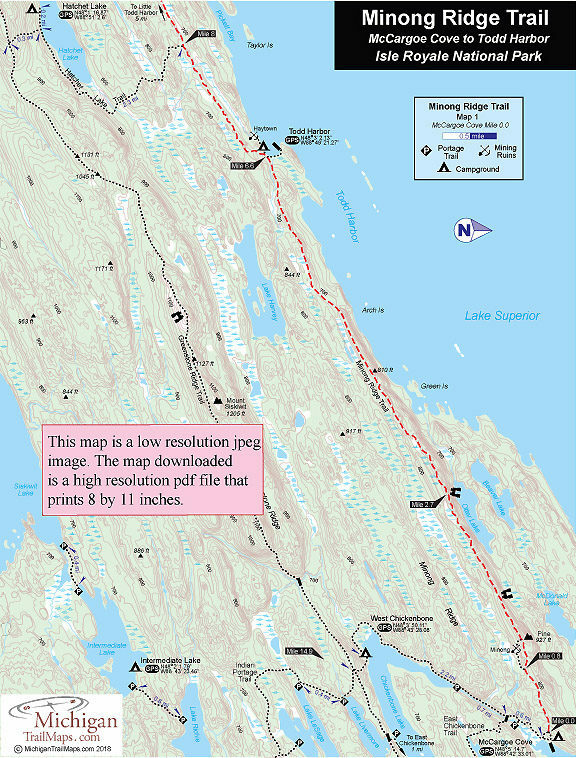 This segment of the Minong Ridge Trail connects a pair of campgrounds; McCargoe Cove and Todd Harbor. 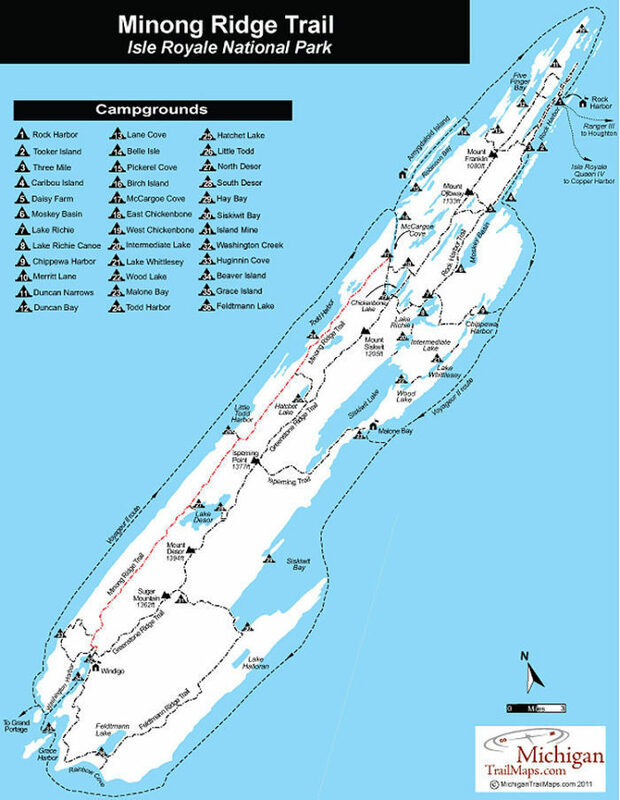 No matter how you arrive at McCargoe Cove, by foot, paddle, or ferryboat plan on spending a night at this beautiful campground. The site has a half-dozen shelters, individual and group campsites, toilets, and tables. There is also a dock where a pleasant evening can be spent watching beaver, waterfowl, or moose feeding across the cove. Todd Harbor is also a favorite among backpackers, because the protected water is usually calm and peaceful and the view across the bay is stunning during sunsets. 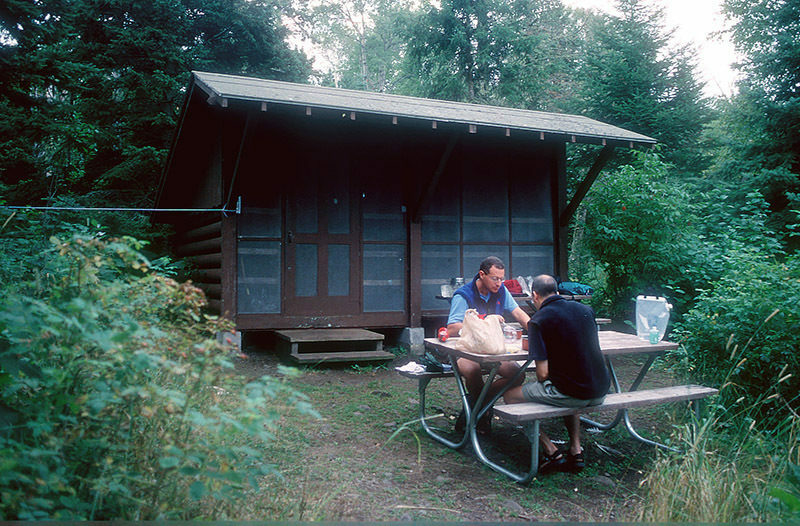 The campground has one shelter, group and individual campsites, pit toilets and a dock. If a northerly wind is blowing, Todd Harbor will be bug-free. Shower tokens, a clean towel, and a bar of soap can be purchased at the camp store at Rock Harbor or Windigo. Some backpackers like to book a room for their final night at Rock Harbor, either at the lodge or in one of the housekeeping units that can be shared by six people and feature small kitchenettes. For reservations, contact the park concessionaire, Forever Resorts (866-644-2003 or 906-337-4993 in summer; www.isleroyaleresort.com). 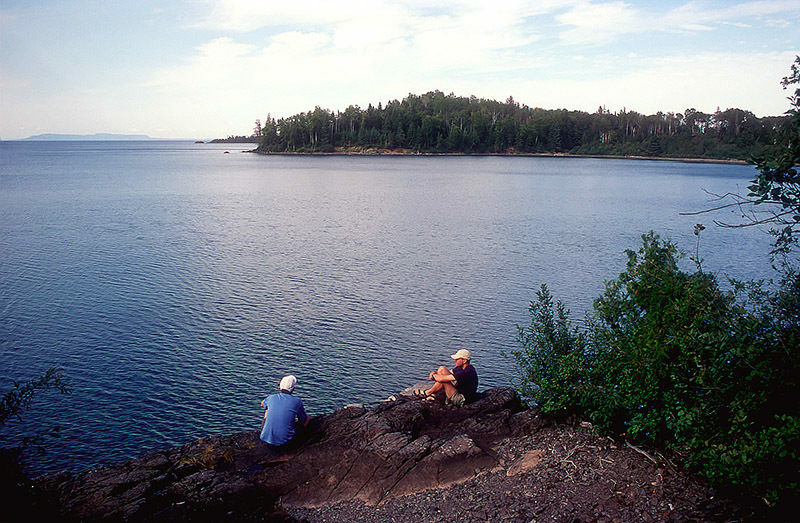 Isle Royale National Park opens April 16 and closes on Nov. 1 to all visitors for the winter. The park has an entrance fee of $7 per person per day or an annual pass for $60. You can pay the entrance fee once you arrive at the park or in advance at pay.gov and avoid congestion and long waits on the island. All park visitors who plan to camp overnight at campgrounds or cross-country sites are required to obtain a camping permit. This permit can be obtained free of charge at the visitor center at Windigo or Rock Harbor when you arrive or onboard Ranger III on the way to the Island. To reach the start of the Minong Ridge Trail on foot follow the first two days of the Greenstone Ridge Trail and then continue on the East Chickenbone Trail to McCargoe Cove, a 2.1 mile hike. Many hikers will hike to Daisy Farm the first day and then to McCargoe Cove via the East Chickenbone Trail the second day. A far easier way to reach the start of the Minong and to save time is to book passage on the M.V. Sandy, the tour boat operated by Rock Harbor Lodge and Marina. Once a week the vessel makes a day-trip to McCargoe Cove from Rock Harbor and can be used by backpackers as one-way transportation. 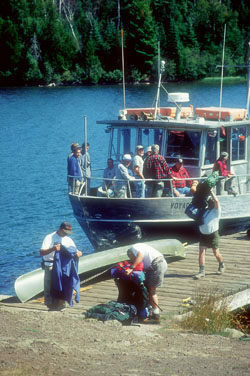 To return to Rock Harbor from Windigo after hiking the Minong book passage on the Voyageur II. Contact the Rock Harbor Resort (866-644-2003 or 906-337-4993 in summer; www.isleroyaleresort.com) to find out the current schedule and costs for the M.V.Sandy. Call the Isle Royale National Park headquarters in Houghton (906-482-0984) or check the Isle Royale National Park website (www.nps.gov/isro). For more information on the M.V. Sandy, contact Rock Harbor Lodge (906-337-4993 (summer) or 866-644-2003 (winter); www.isleroyaleresort.com). For more information on the Voyageur II contact the Grand Portage – Isle Royale Transportation Line (651-653-5872, 888-746-2305; www.isleroyaleboats.com).